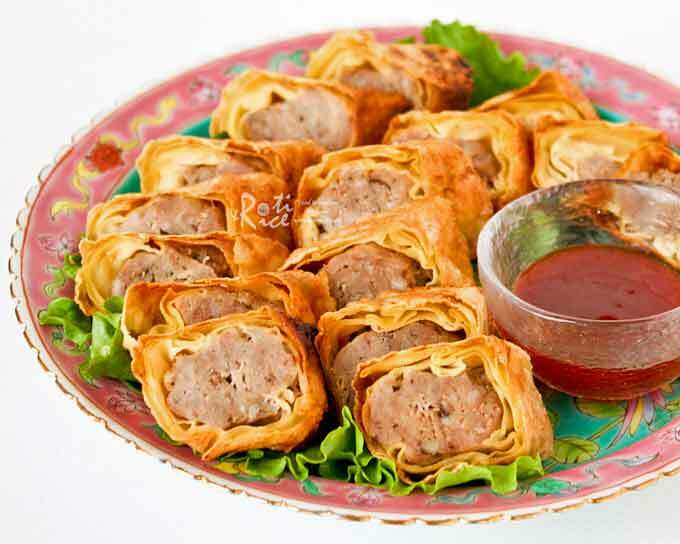 Lobak (Five-Spice Meat Rolls) are delicious pork rolls wrapped in beancurd sheets. These are steamed and pan fried. Just as tasty as the deep fried version. 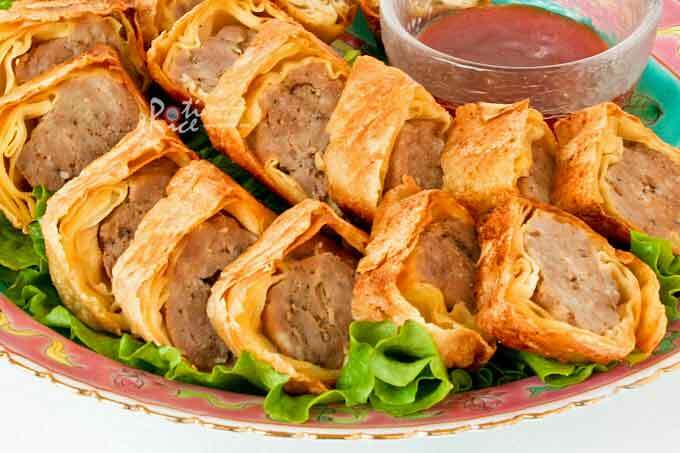 Lobak is a deep fried five-spice pork roll wrapped in beancurd sheet. It has a crunchy exterior with a soft and chewy filling. On the island of Penang, lobak is often made at home by the Straits Chinese as one of the main dishes during festivals and celebrations. At the food courts, it is eaten as a shared or side dish served with deep fried tofu, slices of cucumber, and sweet hoisin and chili sauce. In Kuala Lumpur (as far as I can remember) these meat rolls are also known as lobak but going south towards Malacca and Singapore, they are popularly called ngoh hiang. There are many variations to this dish. Some like the filling to be “meaty” while others prefer it mixed with crunchy vegetables like carrots, water chestnuts, or jicama. Sometimes even shrimps are added to the filling. They are all tasty but I usually make mine with just coarsely minced pork, green onions, and carrots or water chestnuts depending on what I have on hand. The pork can be either coarsely minced or cut into strips. The best beancurd sheets are very thin and almost translucent in appearance. Fresh ones are the best if you can find them. The ones found here come in big round sheets that are folded and frozen. They tend to be brittle and break easily, leaving odd shape pieces that are not suitable for wrapping. I found an alternative as shown below. These come in rectangular sheets measuring approximately 18 inches by 9 inches. Halving the sheets gives two square sheets of 9 inches by 9 inches, perfect for use as wrappers. They may also be cut into three rectangular sheets of 9 inches by 6 inches each. These sheets are a little thicker but they work well and crisp up nicely when fried. There are different ways of wrapping lobak. Usually the meat is place about an inch from the long edge of a rectangular piece of beancurd sheet and rolled. The two edges are sealed with egg white or cornstarch mixture. Alternatively, the short edges on both sides may be folded in before rolling. I like to wrap it spring roll style with the meat placed diagonally on a square beancurd sheet. The three corners are folded over the meat before rolling. Instead of deep frying, I prefer to steam the meat rolls for about 12 minutes and then pan fry them. Combine minced pork, five-spice powder, soy sauce, sesame oil, pepper, salt, and sugar in a large bowl. Leave to marinate in the refrigerator overnight. Cut beancurd sheets into four 9-inch squares. Set aside. Bring minced pork mixture out of the refrigerator. Add egg and mixed-ins** and blend until combined. Divide meat into 4 portions. Shape meat into a log. Place each portion of meat diagonally onto beancurd sheet. Bring a corner of the beancurd sheet over meat. Fold in the sides and roll neatly till the end. Seal with a little egg white. Line a steaming rack with lettuce or cabbage. Place rolls in the rack and steam for 12 minutes over medium heat. Remove and prick rolls with a skewer to prevent air bubbles from forming when frying. Pat dry rolls with paper towels. Heat a non-stick pan with vegetable oil. Pan fry rolls on all sides till golden brown. This should take about 5 to 6 minutes. Drain on paper towels. Alternatively, you can deep fry rolls without steaming. 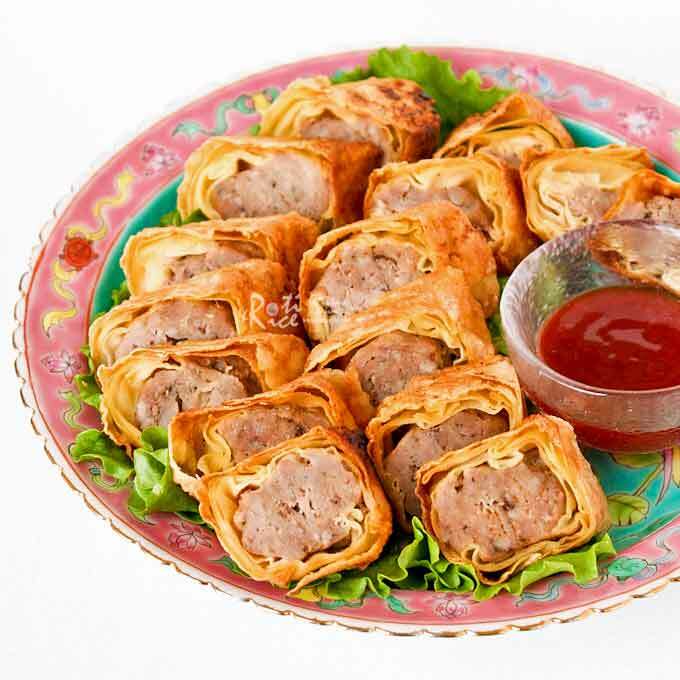 Slice rolls on a diagonal and serve with your favorite sweet chili sauce. **Mixed-ins are optional and one, two, or all three may be added. My favorite chili sauce is Lingham’s Hot Sauce from Malaysia. I try to have a bottle in the refrigerator at all times. Oh boy, these sound terrific! I want to make these, but I’ll have to change it up a bit…just because. 🙂 I have been wanting a good recipe using bean curd sheets, and your step by step instructions and tips are great! Thanks Biren!! Glad to hear you are planning to make these. I can’t wait to see your take on it. Those look amazing, Biren. I think I love anything with five-spice in it. Just the aroma starts me craving it. Thanks for the tips on how to fry the rolls. Thanks a bunch for posting this – I’m definitely going to make it. 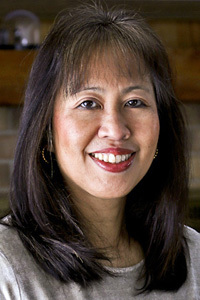 You are most welcomed Cynthia! I made a double batch and saved two meat rolls for pictures the next day when things weren’t so hectic. I hope you enjoy them. Yummy! I love lobak! Gong Xi Fa Cai! Beautiful and tasty! They look like a great appetizer! Good to know it is called “ngo hiang” in Indonesia. Thanks Pepy! these are one of my favorites during CNY and yours look absolutely delicious! Yum! I was hoping you would share this recipe… I look forward to trying this out! 🙂 Hoping the crackling pork recipe is next! 🙂 Thanks for sharing this, Biren! Oh, Biren,, this is so stunning! I loved the pictures and the recipe. Happy Chinese new year to you! 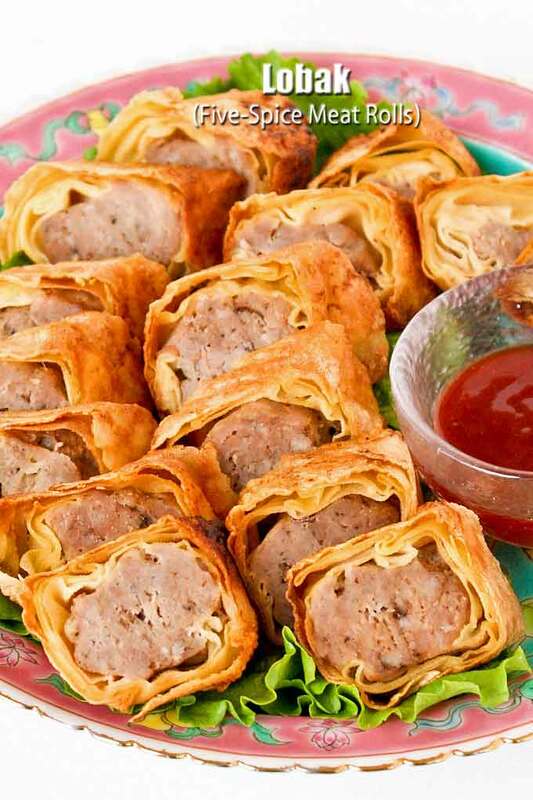 Whoa…those meat rolls look mouthwatering! I love 5spice flavour! Thank-you for showing us how to make these Biren! I never saw the bean curd sheets before, they cook up so light and flaky. I can see why they disappear first – they look incredibly good! oh my…..they look absolutely yummy!Thanks for sharing…will give it a try! Yes, we know it as ngoh hiang in Singapore and usually steam it before deep-frying too, so that the meat is cooked and the deep-fry is just to crisp up the skin. I guess I am not the only one steaming it then. My idea was to cook it first so that I can pan fry instead of deep fry to cut down on the use of cooking oil. Thanks for letting me know how it is done in Singapore. Seriously you have such an amazing talent. Wow, I can’t say enough how amazing those meat rolls look! I am so glad the waiting is now over! I am definitely going to make this one day as it is one of my favourite snacks. I always order the beancurd with fish and prawn fillings when I have dim sum. And when I am back in M’sia, I always look for this dish to eat. Thank you for sharing this recipe, I can’t wait to try this out very soon. Didn’t realize you were waiting for this recipe. I am glad I posted it. Anything with beancurd sheet or tofu is a favorite of mine. Hope to post more recipes with beancurd sheets in the future. I’m with your kids – I love lobak! Actually, I’ve never had it before, but just looking at your pictures and recipe I know it is something that I would absolutely love! It doesn’t look very hard to make at all so I’m definitely going to have to make these. thanks for this recipe! PLEASE save me a plateful of these! 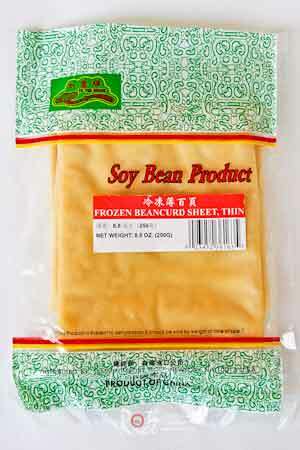 What should i do with the dry sheets of soya beancurd? Should I soak them in the water first before I put the stuffing? Yes, you will have to soak or wipe with a moist towel to soften them.